I am a programmer who saw this site "from" StackOverflow in hope to ask here for help with a specific problem. Things developed reasonably well, but the answer I got did not entirely solved my question. I have 2 rectangles, let us mark them R1 and R2 for easier reading. R1 has constant dimensions, and R2 is calculated by a function that took R1 as an input. Blue is the rectangle function returns. 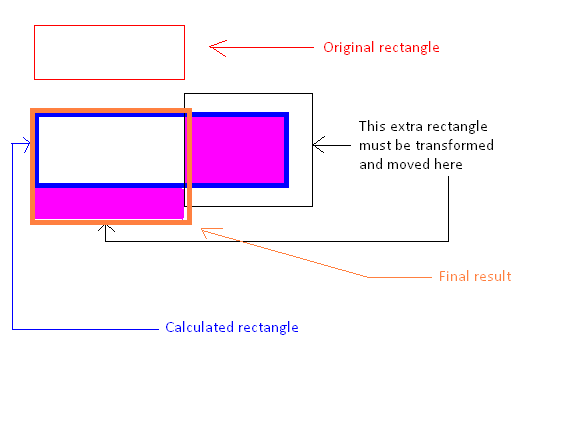 Pink portion on the right is the part I want to "clip", "transform it" and simply adjust blue rectangle's width and height. Since this is meta, I ask you to suggest me a title and tag(s) that would describe this problem the best, to those interested to help me. I can't suggest a title, since I don't understand the question. In particular, it's unclear to me whether you want to move the content to that new position, or just obtain new dimensions. The latter would be fairly easy, but could be stated more concisely without all the background information. The former will depend a lot on why the dimensions don't match, which would make it a poor fit for Math SE. In my personal opinion (and others might disagree), your question has proceeded as far as it can from a mathematical point of view. Now it's down to dirty details of typesetting algorithms, where limited information will result in a lot of guesswork. I'd suggest taking this back to Stack Overflow. No matter where you post this, you should be sure to include relevant information. The way I read the link you provided, the new area will be too wide if a single word is wider than the desired output width. In which case you can't simply move that extra content to the bottom somehow, but instead will have to adjust the font size so that that single word will fit the desired width, and perhaps pad the height to center things. If the output is smaller, then that's either due to hard line breaks or the lengths of words, and in either case you can now adjust font merely based on height, padding horizontally. For the future: I'd suggest you don't ask every question twice, once on Meta to prepare and once for real after getting feedback. Instead, simply ask the question, and indicate (perhaps in an introductory paragraph) that you are not yet convinced of on-topicness, title, tags or whatever, and that you invite people to edit and adjust the latter two, or to downvote / vote to close to indicate that they don't think it on topic. That way, people won't have to read your questions twice, and meta stays more meta.